Dorset is a fantastic place to search for fossils because it is home to The Jurassic Coast – a 95 mile stretch of stunning coastline from Orcombe Point near Exmouth in East Devon to Old Harry Rocks near Swanage in East Dorset. The rocks span the Triassic, Jurassic and Cretaceous periods. The best time to find fossils is in the winter because there are less people around to compete with and the winter storms uncover new rocks. 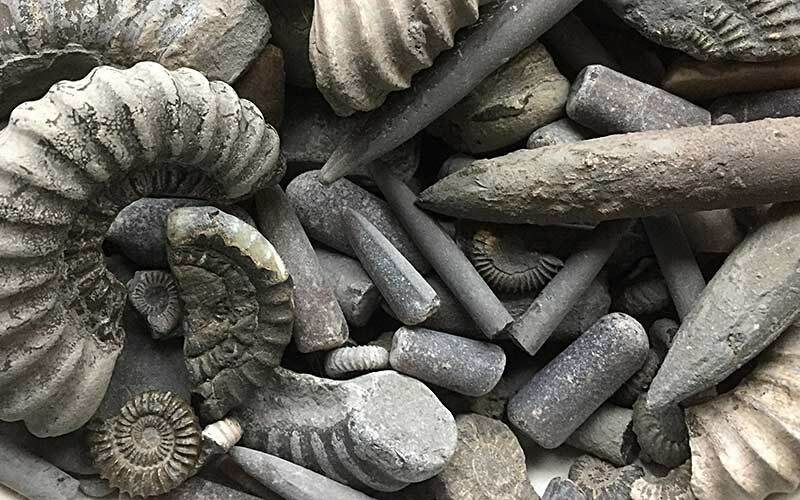 Common fossil finds along The Jurassic Coast include ammonites and belemnites. Ammonites were shelled cephalopod molluscs that lived in the sea during the Mesozoic (Triassic, Jurassic and Cretaceous periods). The shells have a wonderful spiral that expands from a central point. 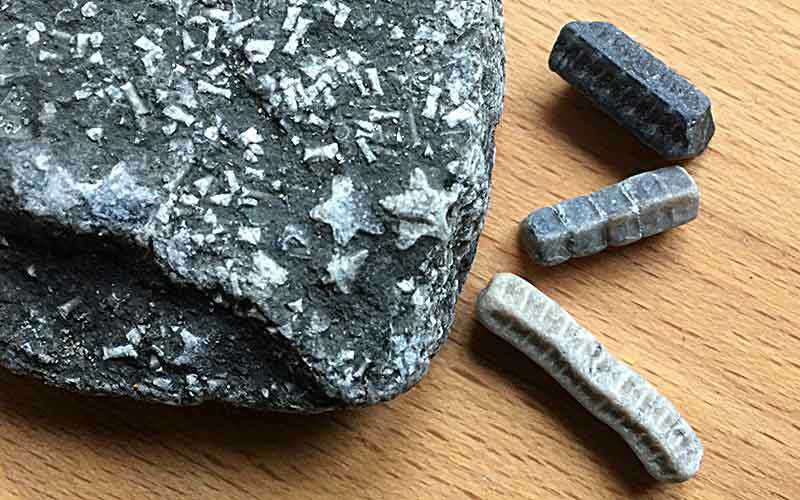 Belemnites were similar to modern day squid and also related to the ammonites. The soft parts of the animal are rarely found fossilised but the guard and the phragmacone – the hard parts – are frequently found, although the guard is more common than the phragmacone because it is less fragile. The belemnite guard is long and pointed, resembling a bullet. They have also been called bullet stones and are usually made from calcite. The guard was located furthest from the head of the belemnite. At the end closest to the head, the guard had a conical cavity and within this was the base of the phragmacone. The phragmacone was used to aid with buoyancy and can sometimes still be found attached to the guard. You may also come across criniods. Look in small gravel for short rods with a star-shaped end. The best place to hunt for fossils is on the beach because the sea will have exposed them for you. Keep your eyes peeled and take a small tub to put your smaller finds in. If you’re really lucky you might find fossilised fish or ichthyosaurs. Before you head out, check the weather conditions and the tides. Ideally go out on a falling tide because more of the beach is exposed and you are less likely to get cut off. Be aware of landslides, large waves, mudflows and falling rocks.